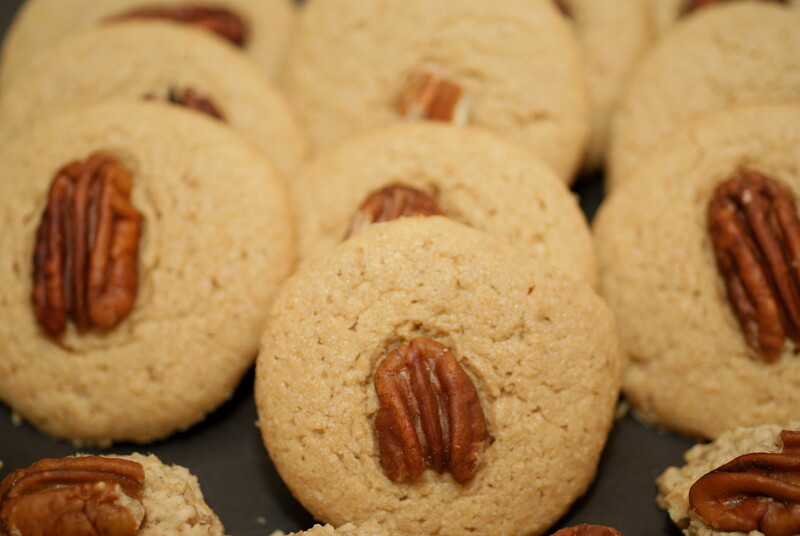 This weekend I was baking for a small crowd coming to my house for a game of Settlers of Catan, and I wanted to make Maple Pecan Cookies to celebrate my favorite time of year. I already had a tried and true whole wheat recipe that I used a lot last year (before I went gluten-free), so I figured I’d make a batch of the wheat cookies, but also do a little experimenting to get a tasty gluten-free alternative. I made my own oat flour this time for a less refined consistency. To make your own oat flour, place gluten-free rolled oats in a food processor or blender and pulse 30-60 seconds. Here’s a helpful link to making your own flours at home. 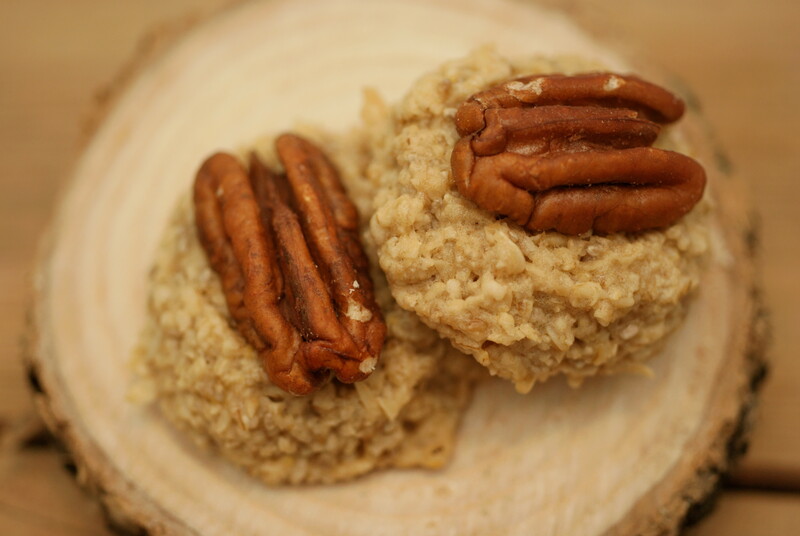 The gluten-free oat cookies were a hit, just as tasty as the wheat version, despite the fact that I cut down on the sweetness and added a salba “egg” to help the cookie hold together without xanthan gum or real eggs. So you probably have two questions right now: What the heck is salba? and What exactly is a salba “egg”? I didn’t know what Salba seeds were until a few months ago when my dad came to Chicago for a visit and brought me a whole bag of Salba seeds to start experimenting with (Thanks Dad – perfect gift!). Salba seeds are like white Chia seeds (that’s right, the same Chia used for “hair” on the Ch-Ch-Ch-Chia pet popular in the 1980’s), which it turns out happen to be exceptionally nutritious. 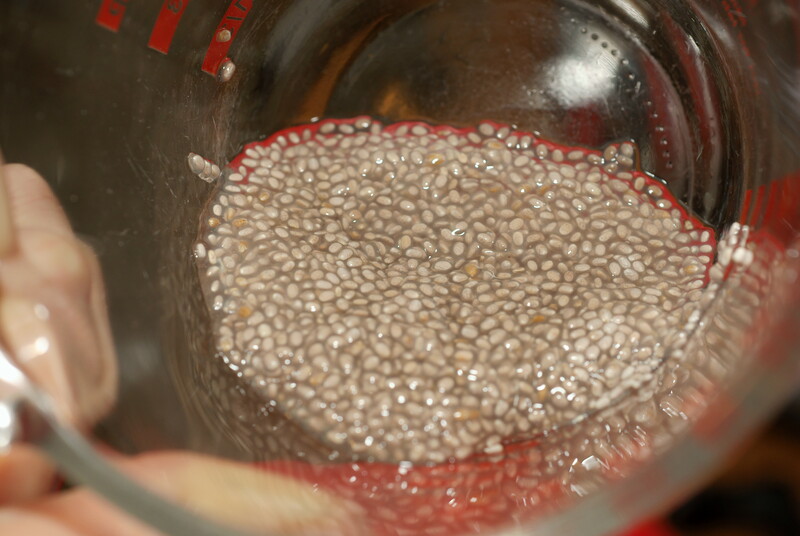 Salba seeds are grown under tight regulations in Peru to maintain a consistently high nutritional composition, whereas Chia seeds’ nutritional makeup are frequently diminished because they grow wild in large quantities throughout Mexico, and Central and South America, and are not subject to the same strict regulations. Don’t get me wrong though, both Chia and Salba seeds are very nutritious and, like flax seeds, super easy to incorporate into your daily diet. Read a more extensive comparison of Chia vs. Salba and all the nutritional benefits of both here. Now to explain the Salba “egg”. At some point while browsing through blogs and recipe sites I read about a Chia egg, made by mixing 2-3 teaspoons chia seeds with 3 tablespoons of water and allowing the mixture to sit and congeal for about 10 minutes to use as an egg substitute. I’m all about this kind of health food magic, so I jotted the recipe down at the bottom of my notebook as a reminder to try it sometime. Even though my original whole wheat maple cookie recipe didn’t call for an egg, I know that gluten-free flours lead to cookies lacking in structure unless you add something gooey, like banana, or a gum (xanthan), or eggs. No reason to pass up a perfectly good opportunity to add lots of omega-3s, fiber, antioxidants, magnesium, calcium, iron and folate, so I tried the Salba egg structure in these cookies, and couldn’t be happier with the result! I hope you’ll pick up a small bag of Salba or Chia if you come across them in a health food store and try this recipe out for yourself. The cookies are outrageously good, and something you can feel happy about sharing with your family and friends this fall…even the tikes. Mix 2 teaspoons Salba with 3 Tablespoons water and allow to sit and congeal at least 10 minutes. Preheat oven to 375. Make salba/chia egg in a small bowl and allow to sit 10 minutes while assembling and mixing other ingredients. In medium bowl, use a hand mixer to cream butter, maple syrup and vanilla 30 seconds on medium speed. Add salba egg substitute, and mix until you have a smooth consistency (no visible large clumps of butter). Add oat flour, baking powder and salt and mix briefly. Using a cookie scoop or two spoons, use about 2 teaspoons of batter to form each cookie. 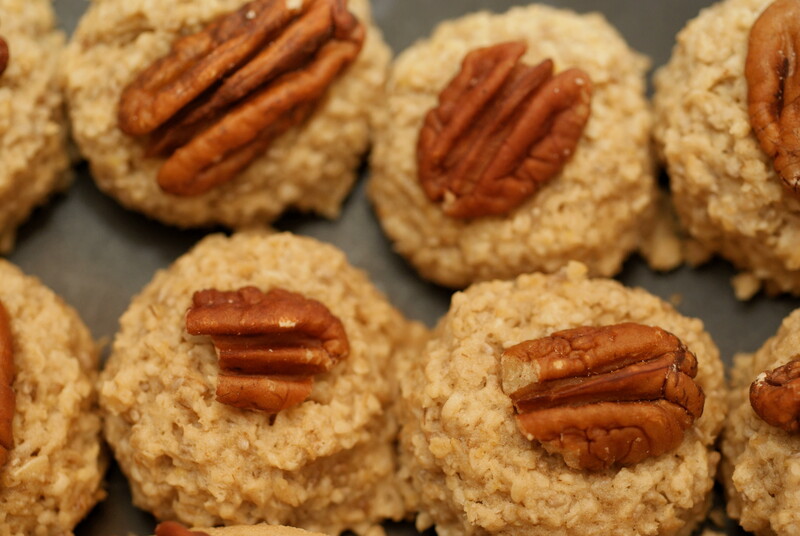 Place on ungreased cookie sheet 1” apart and top with pecan halves. Bake 12-15 minutes. Makes 14 cookies. Preheat oven to 375. Using a hand mixer, cream butter, maple syrup and vanilla. Add flours, baking powder and salt and mix well. Using a 2 teaspoon cookie scoop, or two spoons, form round cookies and place 1 1/2” apart on ungreased cookie sheet (these cookies spread a little). Top with pecan halves, pressing slightly into the cookie dough. Bake 12-13 minutes or until cookies turn a light golden brown. These are delicate when warm so allow to cool on baking sheet 3-5 minutes before removing to a cooling rack.